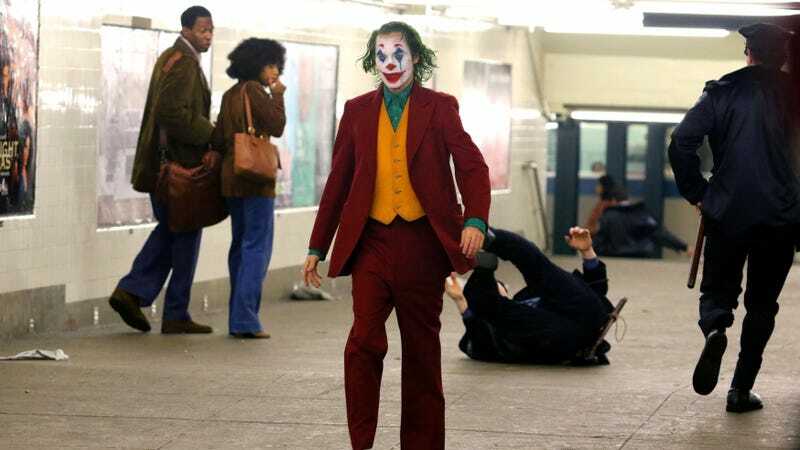 Joaquin Phoenix's Joker Movie Extras Had to Pee on a Train? Production has begun on The Joker, the latest reincarnation of the Batman-universe character, this time played by Joaquin Phoenix, who I feel it’s important to point out has the same haircut as a medieval knight. The movie reportedly takes place in the ’80s and Phoenix plays a failed stand-up comedian who turns to crime, which seems believable given the male stand-up comedians I know. TMZ reports that while filming a scene in a Brooklyn subway station, extras on the film were locked in a train car after two hours of work. The extras reportedly banged on the doors of the car because they needed to take a bathroom break but eventually had to pee in between the cars. (Seems like a prank the Joker would pull.) Now what’s scarier: Phoenix’s clown look or the potentially horrific labor violations happening on set? According to the report, SAG and Warner Bros. are looking into the incident, but Jezebel has also reached out for updates from both as well and will update this post if they respond.